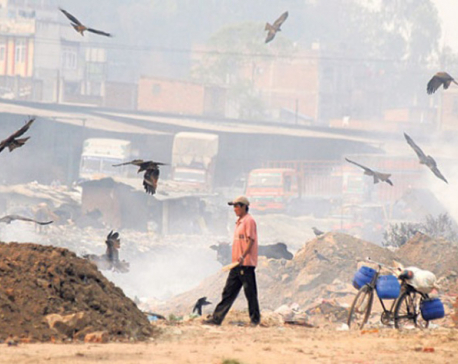 KATHMANDU, Nov 11: At least 35 metric tonnes of solid waste have been managed under the clean-up campaigns of different rivers and ring road clean-up campaign in Kathmandu valley on Saturday. 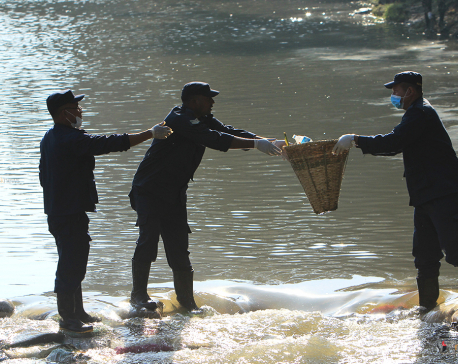 Eight tonnes of garbage were picked up from Pashupati and Kailash Danda area under the Bagmati Clean-up Mega Campaign that entered the 235th week today. The participation saw more than 600 people from different walks of life, the High Powered Committee for Integrated Development of the Bagmati Civilization, Kathmandu Metropolitan City, Nepal Army, the Nepal Police, and Armed Police Force, Nepal, said campaigner Mala Kharel. Similarly, two metric tonnes of solid waste were picked up from Hanuman Ghat and Gothatar bridge in the Guheshwari area as part of Guheshwari Bagmati Clean-up Campaign that made it to the 195th week today. More than 150 people took part in the campaign. Two metric tonnes garbage was collected from Manamaiju area under 163rd week of Bishnumati Clean-up campaign. About two metric tonnes of solid waste were collected as part of the Manohara River Clean-up Campaign that reached the 33rd week. Likewise, fifteen metric tonnes of garbage were picked up from New Buspark, Gongabu area under the Ring Road Campaign that made it to the 301st week today.